Hello, I've ordered and received a set of the non-Epson cartridges for my Epson Stylus Photo 1290S printer (very happy with them - thanks). Unlikely as it is, I thought I'd ask if you have ICC profiles for these cartridges? Many thanks, Chris. Unfortunately, we do not have the ICC profile for these cartridges. Whether you need it to print important work documents or school work, the Epson 1290 S doesn't let you down. Inevitably your Epson 1290S will run dry of printer ink, and then you'll soon realise that buying Epson 1290S ink is typically pricey. But you do not need to get stressed about paying the high prices you'll discover on the high street because here at Cartridge Save you can purchase all the Epson 1290 S cartridges you will need at seriously low prices. Spend less money on your ink by shopping at Cartridge Save! There's no sense in spending so much for the 1290-S original cartridge or 1290S compatible ink in the high street when it is easy to save a wadge of money shopping with Cartridge Save. You can have complete confidence by ordering Stylus Photo 1290S ink cartridges from us because everything is covered by a no quibble money back guarantee. Be mindful of the fact that each and every order also has free delivery, most likely arriving with you the next business day! The Epson Stylus Photo 1290S is a large format printer capable of handling larger media. It delivers high-quality photos and prints with a maximum resolution of 2880 x 720 dpi. Print speeds can go as fast as 9.4 ppm for black and white and 9 ppm for coloured. The Stylus Photo 1290S from Epson comes along with a good photo software. The initial cost is reasonable, but be ready to shell out for the ink cartridges as it may need frequent changing. The Epson Stylus Photo 1290S inkjet printer has a standard size of 609 x 311 x 175 and weighs 8.4 kg. It is quite compact when not in use but when its paper trays are extended may take up a large foot print. In terms of layout, the Epson Stylus Photo 1290S colour printer has function buttons on the front and a parallel port and USB port at the back. The Epson Stylus Photo 1290S can handle 100 sheets at a time and can handle media sizes like A6, A5, and A3+. With the Epson Stylus Photo 1290S, users can expect lab-quality photos on large format prints. The Epson Stylus Photo 1290S is a highly versatile A3+ photo printer which is reasonably priced and also has reasonable print speed. The Stylus Photo 1290S printer can work on both Macintosh and Windows operating systems. 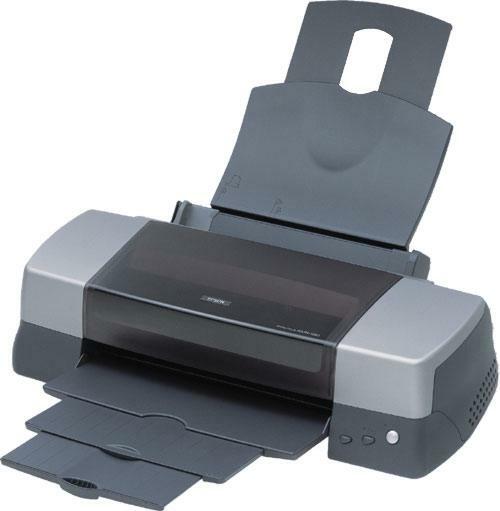 The Epson Stylus 1290S photo printer may be an ink hog especially when users print photos in best mode. The Epson 1290S photo printer also has clogging ink issues when not used regularly.